Sampling of cases where Mr. Luft, a Toronto Criminal Lawyer, has successfully represented his clients. The results are for cases that were completed in 2012 only. In each case, the charges were either withdrawn, stayed, dismissed or a full acquittal was entered following a contested trial. Please note that past successes do not guarantee future results. R. v. D.A. – D was charged with possessing a firearm without a licence, possessing an unauthorized prohibited firearm, possessing a firearm with ammunition, careless storage of a firearm and possession of weapon obtained by crime . Result: Following his preliminary hearing, the Crown Attorney withdrew all the charges against Mr. D.R. v. Y.W. – Mr. W. was charged with several counts relating to possessing a loaded prohibited firearm. Result: W discharged of all counts at the preliminary hearing. R. v. J.C. – Mr. C. was charged with 3 counts of break and enter. Result: Following a preliminary hearing that lasted 3 days, Mr. C. was discharged of all counts. R. v. J.A. – Mr. A. was charged obstructing a police officer. Result: His charge was withdrawn at the request of the Crown Attorney. R. v. M.S. – Mr. S. was charged with pointing a firearm, possession of a firearm and uttering a threat to cause death. Result: All charges dismissed following a preliminary hearing. R. v. K.C. – Mr. C. was accused of robbery. Result: Mr. C. was acquitted of robbery following a contested trial. R. v. K.C. – Mr. C. was accused of not comply with his bail conditions. Result: Charge withdrawn. R. v. K.D. – Mr. D. was charged with assault and obstructing a police officer. Result: All charges withdrawn. R. v. J.M. – Ms. M was charged with failing to comply with the terms of her bail. Result: Charge withdrawn. R. v. A.H. – Mr. H. was charged with failing to comply with the terms of his bail. Result: He was acquitted following a contested trial. R. v. A.H. – Mr. H. was charged with failing to comply with the terms of his probation by failing to report to a probation officer. Result: He was acquitted following a contested trial. R. v. J.M. – Ms. M was charged with theft over $5000, possession of stolen property over $5000, break and enter and mischief to property over $5000. Result: All charges withdrawn. R. v. T.M. – Mr. M. was charged with mischief to property. Result: Charge withdrawn after client entered into peace bond. R. v. R.C. – Mr. C. was charged with sexual assault. Result: All charges withdrawn. R. v. W.W. – Mr. W was charged with two counts of failing to comply with the conditions of his bail. Result: All charges were withdrawn. R. v. M.J. – Mr. J. was charged with assault. Result: Mr. J was acquitted following a trial. R. v. C.W. – Mr. W. was charged with assault, assault causing bodily harm and uttering a threat to cause death. Result: Mr. W acquitted of all charges following a trial. R. v. D.B. – Mr. B. was charged with accessory after the fact and possession of property obtained by crime. Result: All charges withdrawn. R. v. F.H. – Mr. H. was charged with assault. Result: Charge withdrawn. R. v. M.S. – Mr. S. was charged with failing to comply with his recognizance. Result: All charges withdrawn. R. v. R.G. – Mr. G was charged with assault, assault causing bodily harm and mischief to property under $5000. Result: All charges withdrawn. R. v. T.B. – Ms. B was charged with possession of marijuana for the purpose of trafficking, possession of proceeds of crime and possession of a prohibited weapon. Result: All charges withdrawn. R. v. G.R. – Mr. G. was charged with robbing a bank and possession of stolen property. Result: All charges withdrawn. R. v. D.H. – Mr. H was charged with Sexual Assault x 2, Assault with a Weapon and Assault. Result: All charges withdrawn. R. v. G.R. – Mr. R. was charged with Assault Causing Bodily Harm, Assault and two counts of Causing Mischief to Property under $5000. Result: All charges withdrawn. R. v. P.D. – Accused was charged with Failing to Comply with a Recognizance and Theft Under $5000. Result: Charges withdrawn. R. v. D.T. – Mr. D was charged with possession of marijuana and being found in a bawdy house. Result: His charges were withdrawn. R. v. J.A. – Mr. A. was charged with possession of a prohibited weapon. Result: His charge was stayed. R. v. R.P. – Mr. P was charged with Possession of Cocaine for the Purpose of Trafficking, Possession of Cocaine x 2, and Possession of Proceeds of Crime. Result: All Charges Stayed. R. v. J.A. – Mr. A charged with Assault Causing Bodily Harm. Result: Accused was acquitted following a contested trial. R. v. A.J. – Mr. J charged with Possession of Marijuana for the Purpose of Trafficking, Possession of Methadone for the Purpose of Trafficking, Possession of Hydrophone for the Purpose of Trafficking, Possession of Morphine for the Purpose of Trafficking, Possession of Codeine for the Purpose of Trafficking, Possession of Anabolic Steroids for the Purpose of Trafficking, Possession of Lorazepam for the Purpose of Trafficking, Possession of Fentanyl for the Purpose of Trafficking & Possession of Proceeds of Crime. Result: Accused was discharged following a preliminary hearing. R. v. V.E. – Mr. E charged with Possession of Marjiuana. Result: Charge withdrawn. R. v. A.M. – Client charged with Assault with Weapon, Uttering Death Threats and Possession of a Weapon. Result: Charge withdrawn. R. v. R.P. – Client charged with Fail to Appear for Court after he purportedly missed his court appearance. Result: Charge withdrawn. R. v. V.E. – Client charged with possession of Cocaine. Result: Charge withdrawn. R. v. K.M. – Client charged with fail to appear for court. Result: Charge withdrawn. R. v. C.S. – Client charged with robbery and assault causing bodily harm. Charges withdrawn prior to trial. R. v. R(G.) – The accused was charged with sexual assault causing bodily harm, being a party to a sexual assault, and forcible confinement. Mr. Luft represented the accused throughout the proceedings – from bail hearing to trial. The accused elected to have a trial before a judge and jury and to have a preliminary hearing. At the preliminary hearing, the complainant testified and Mr. Luft cross examined her. After completing the preliminary hearing, the case was sent to the Superior Court of Justice where a trial was scheduled. Prior to the trial commencing, the Crown stayed the charges against the accused because there was no reasonable prospect of conviction. Part of the result for this was because of prior statements that the complainant had made during the preliminary hearing, and in particular during cross-examination, that were inconsistent with statements she made at other times. R. v. D.K. – The accused was charged with possession of marijuana for the purpose of trafficking and possession of cocaine. The drugs were found on the accused after the vehicle where he was a passenger in was stopped by police officers from the Toronto Police. During the vehicle stop, Mr. K. was asked by one of the police officers to exit the vehicle and was searched. Mr. Luft filed an application pursuant to Section 8 of the Charter of Rights and Freedoms to exclude the drugs that were found on the accused. After the application was filed, the prosecutor contacted Mr. Luft to ask him if his client would perform 20 hours of community service in exchange for a withdrawal. Mr. K completed the community service hours and his charges were withdrawn. R. v. R.A. – Mr. A was charged with 2 counts of assaulting a police officer, mischief to property and assault with a weapon. The accused was a young adult without a criminal record. When Mr. A first met with Mr. Luft after his bail hearing, Mr. Luft advised his youthful client to enter counselling. The accused took the advice of his lawyer. Eventually when Mr. Luft met with the Crown Attorney, he was able to put forward a very positive report on Mr. A. This report was instrumental in persuading the Crown that it was in the public interest to allow the accused to enter diversion. After Mr. A completed diversion, the Crown withdrew all of his charges. R. v. V.C. – Mr. C was charged with failing to comply with a recognizance. Mr. C. was on a house arrest bail but had a limited exception that he could be away from his residence if he was with his surety. One cold winter day, the police stopped a motor vehicle where he was a rear passenger. The police officer asked all 4 males in the vehicle for their name and then searched their names on their cruisers on-board computer. Moments later, the police officer returned to the car and arrested the accused for failing to comply with his bail. In anticipation of a Charter application at the accused’s trial, the Crown withdrew his charge. R. v. J.V. – Mr. V was charged with assault causing bodily harm following an altercation at a bar where the complainant suffered a dislocated shoulder. Mr. V had no criminal record. The case proceeded to trial where the only issue was whether Mr. V acted in self-defence. The Crown Attorney called 5 civilian witnesses and 1 police officer during the course of the trial. In response, Mr. V testified that he was attacked by the complainant. The trial judge acquitted Mr. V on the grounds that he had acted in self-defence in accordance with Section 34.1 of the Criminal Code. Click this link for an article explaining assault. R. v. M.Z. – Charge: Theft Under $5000. Result: Charge withdrawn. R. v B.A. – The accused was charged with possession of cocaine and possession of ecstasy after a police officer purported to observe a small amount of cocaine in the accused’s vehicle outside of a busy Toronto night club. Mr. Luft reviewed disclosure and then met with a prosecutor from the Department of Justice. At the meeting, Mr. Luft persuaded the prosecutor to allow his client to enter a drug counselling program in exchange for a withdrawal of the accused’s charges. After he completed the program, both charges against Mr. A were withdrawn. R. v. T.R. – Mr. R was charged with assault and assault with a weapon. The complainant in this case was his 11 year old daughter. Mr. Luft was initially hired to represent the accused at his bail hearing. After successfully securing the accused’s release, he retained Mr. Luft to defend him. Over several meetings, Mr. R and Mr. Luft developed a strategy with the hope that the Crown Attorney would eventually withdraw the charge against his client. The strategy involved the accused attending counselling sessions. This strategy worked as the charges against the accused were withdrawn several months later. R. v. J.C. – The accused was charged with forcible entry, possession of proceeds of crime and theft under $5000. The accused contacted Mr. Luft after he had been sitting in jail for nearly a month. Mr. Luft immediately obtained bail for the accused. He then scheduled a preliminary hearing. However, the charges against the accused were withdrawn prior to the preliminary hearing starting. R. v. J.M. – The accused was charged with possession of cocaine for the purpose of trafficking, possession of cocaine and being in possession of proceeds of crime. Prior to the start of his preliminary hearing, the prosecutor withdrew all the charges against Mr. M.
R. v. R.S. – The accused was charged with theft under and two counts of assault following a fight that occurred in the parking lot of a local Toronto apartment building. The complainants alleged that the accused, along with a group of other men, swarmed and attacked them. A trial was scheduled but prior to trial, the Crown withdrew the charges against the accused. R. v. D.T. – The accused was charged with possession of a counterfeit credit card and with possession of a credit card scanner. The police officer who arrested Mr. T claimed that while he was on patrol, he observed a vehicle parked in a school parking lot and the police officer walked up to the vehicle after he claimed that he could smell marijuana smoke coming from the car. When he arrived at the car, the officer claimed that he could observe, in plain view, a credit card scanner in the back seat of the vehicle. The officer arrested the driver and Mr. T. After he was placed under arrest, Mr. T was searched. During the search,the police officer found a counterfeit credit card in the accused’s wallet. The case was set for trial. Prior to trial, an application pursuant to the Canadian Charter of Rights and Freedoms was filed attacking the validity of the search and initial detention. In the face of a strong application by the accused, the Crown agreed to withdraw the charges against the accused if he completed community service hours. R. v. D.N. – client was charged with aggravated assault, assault with weapon, forcible confinement and robbery. Mr. Luft represented the accused at his bail hearing and secured his release. 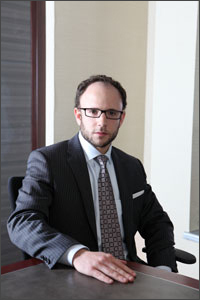 Mr. Luft, Toronto criminal lawyer, then represented the accused at his preliminary hearing. The case was eventually scheduled for a trial. Prior to the trial commencing, the Crown Attorney withdrew all the charges against Mr. N.
R. v. R.B. – Mr. B. was charged with assaulting a security guard. The accused was a young man with no criminal record. The charge against the accused was stayed after he completed diversion. R. v. K.R. – The accused was charged with assaulting a police officer and possession of marijuana for the purpose of trafficking. The accused was targeted by police after they received information from an “informant” that Mr. R. sold marijuana. The police officers acted on this information and approached Mr. R. Mr. R was uncooperative with the police officers and tried to walk away from them. When he did this, the police officer grabbed Mr. R. who reacted by pushing the officer. After a brief struggle, Mr. R was placed under arrest for assaulting a police officer. Mr. R was searched and 8 grams of marijuana was found in his jacket pocket. The police officer then charged him with possession of marijuana for the purpose of trafficking. The accused tried to fight these charges himself at first before he hired Toronto criminal lawyer, Mr. Luft. Mr. Luft scheduled a trial and filed a Charter application arguing that the search of the accused was illegal and that the officer had arbitrarily detained him. Prior to trial commencing,the Prosecutor agreed to allow Mr. R. to enter diversion. After the accused completed diversion, his charges were withdrawn. Contact Mr. Luft at 416-433-2402 for a free initial consultation.